Sitting next to Tasman bay between the two ‘ears’ at the top of the South Island, Nelson is extremely well-placed to explore the region. It’s a 90-minute drive from Blenheim and its famous wine country, and just 1 hour from the splendor of Abel Tasman National Park. This makes it an easy stop during any trip through the region, and one that is well worth it. It’s a relaxing, easygoing place that is worth stopping in even just for a few hours – there is plenty to do! Nelson is famous for its local arts and crafts (it’s a great place to buy some authentic NZ souvenirs! ), a growing restaurant scene, and some lovely day walks! We visited the Matai Valley Dun Mountain Bike & Walking Trail just outside the town, and its definitely one to add to your itinerary! The Matai Valley is a popular local recreation area just to the east of Nelson, with a wealth of ways to engage with nature. The area extends over 10,000 hectares over the valley. It contains a picturesque golf course, swimming holes and numerous trails for walkers and cyclists. It’s a wonderfully relaxing place to spend a few hours or even a full day, depending on the length of your visit. 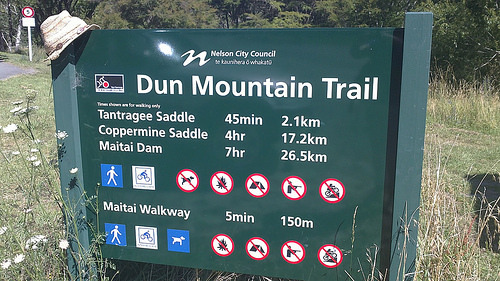 The Matai Valley Dun Mountain Bike & Walking trail is a great stroll, and so scenic! 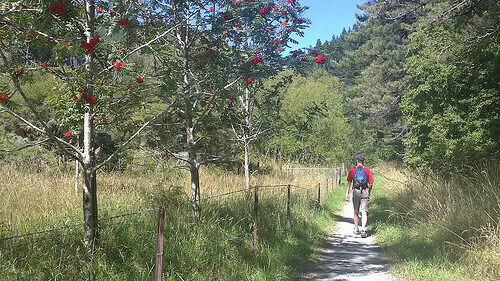 It’s also the ideal walk to do if you’re visiting Nelson, because it’s so close to the actual city. Just head down Nile Street, and turn left into the Matai Valley Road. 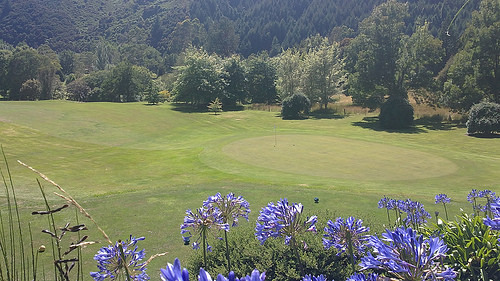 Go pass a couple of beautiful reserves, and the entrance to the beautifully laid out 9-hole Waahi Taakaro Golf Course. Turn into the camping grounds on your right. 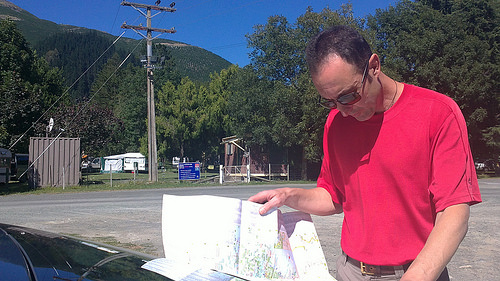 Unlike this guy, you don’t need to pore over a map – just look at the detailed signage behind him! This sign at the start of the walk will tell you all you need to know. In fact, the signage for trails throughout New Zealand is of very high-quality. This is great if you happen to stumble across an interesting-looking trail during your travels. It will give you the distance and an estimate of the amount of time involved, as well as the difficulty level. Signage continues throughout the trail too, so you have very little chance of getting lost! 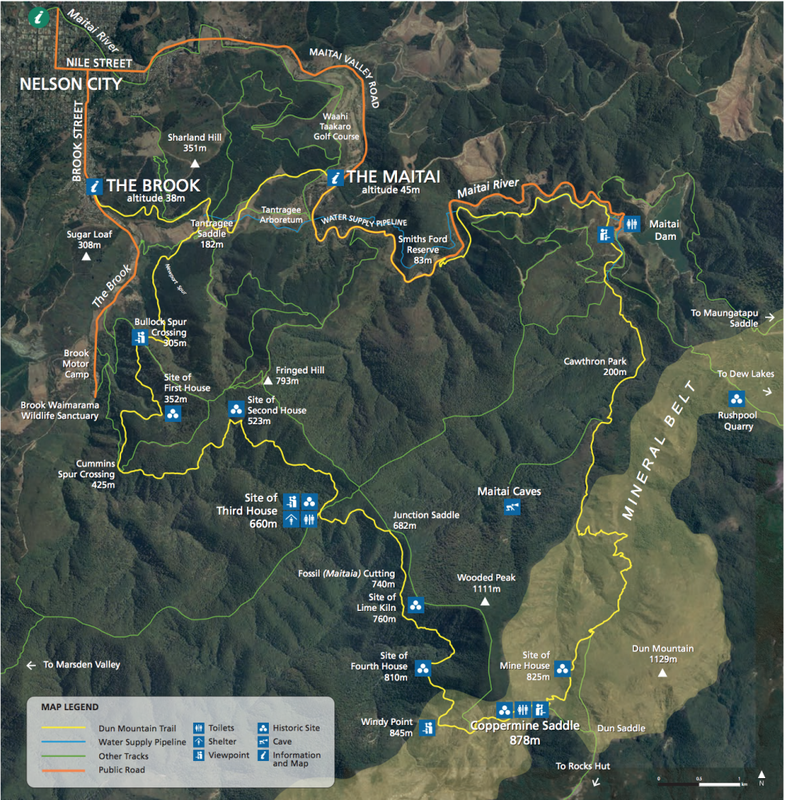 You can also find a more detailed map of the entire Dun Mountain Bike & Walking trail online, for those of you who are feeling adventurous! These trails are full of lovely and unexpected variety. Many contain a diverse array of native plants. On the day we walked, the trees were plump with ripening fruit. 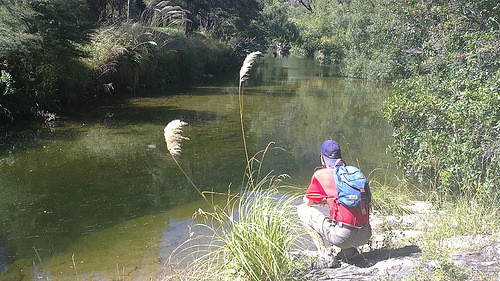 It’s a great idea to check the trail offerings close to urban areas in New Zealand; it’s a fun opportunity to experience the recreational opportunities available to the locals! One of the best things about this trail is that it can be during any season; the northern region of the South Island has a very easygoing climate of mild winters and warm, dry summers. You don’t need to worry about the more volatile weather conditions that you can encounter in the South Island’s alpine regions. There’s something so soothing about the sound of a gentle river! The Maitai River runs right through the reserve, and it’s a really peaceful accompaniment to the walk. On the Dun Mountain Bike & Walking Trail, you’ll get to meet plenty of serious Mountain Bikers and joggers. Everyone seems to be very respectful about giving way; just make sure to keep an ear out for any approaching bikes! Most people are using this track just want to keep fit, have fun and experience nature. The trail meanders around the side of the hills and you’ll be astounded when the most spectacular valley suddenly appears. 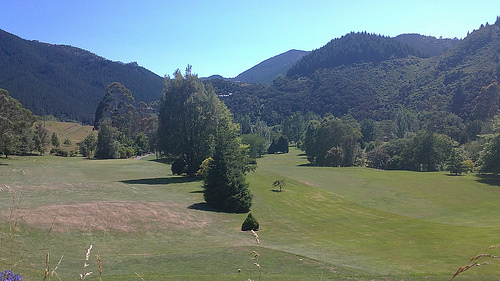 You’ll get the full panoramic view of the Waahi Taakaro Golf Course below. It’s a lovely tree-lined course which is full of native birds. Be sure to listen out for the chorus of tui and kereru! 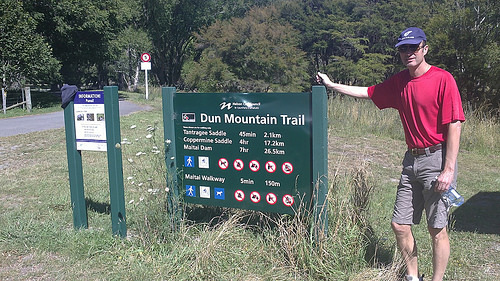 The part of the Dun Mountain Bike & Walking Trail that we chose was not really that challenging. But as we looked further ahead, you could actually see the Mountain Bike track winding very steeply around the hills. I think you’d have to be pretty keen to tackle these ones! But for those who are keen cyclists or hikers, it’s a really great challenge with some great views as a reward! There are far more offerings besides this in the region: check out our guide for our favourite Nelson day walks! Before heading back for some lunch, this guy was intent on showing that, he knew about that signage all along……yeah right! For more relaxing nature experiences, check out our dedicated nature and lifestyle itineraries!